I feared fermenting veggies for a long time. What if I give my family food poisoning? How will I know if something is fermented properly? Isn’t it all too complicated? But now that I took the plunge, I wish I had done so earlier. This recipe, even though it has 8 steps, is utterly simplicity and produces a tender, tangy, and flavourful kraut. A chopped jalapeño only deepens the flavour without adding too much heat. Add two if you want more zip. I’m not a big fan of veggie dogs, but with a homemade bun and this kraut, I would eat them any day. 1. Remove 2-3 outer leaves from the cabbage. 2. Core cabbage, and slice very thinly (a food processor works wonders here). 3. Woking in batches if necessary, place cabbage (and jalapeño, if using) in a large non-reactive bowl and sprinkle with salt. Start mashing/squeezing the cabbage with your hands, or use a wooden sauerkraut pounder. This will force liquid from the cabbage. 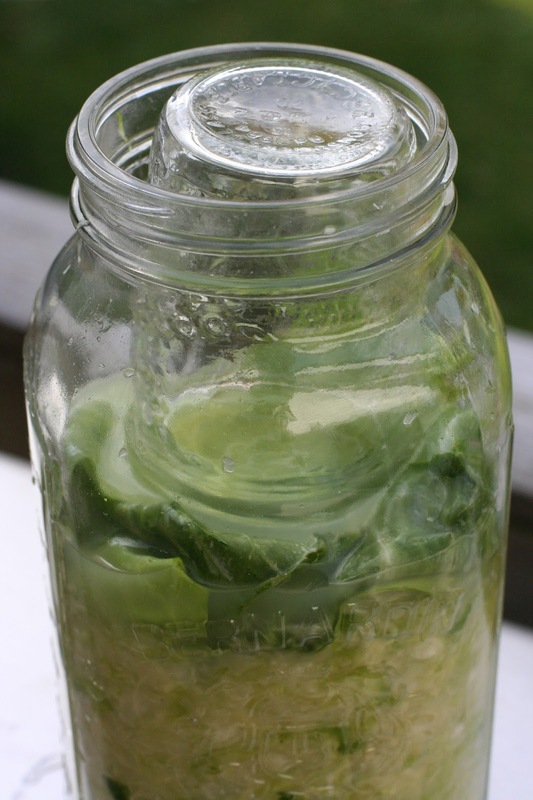 The cabbage will start to go translucent, and you should get a good amount of liquid from it. If not, use a little more salt. 4. 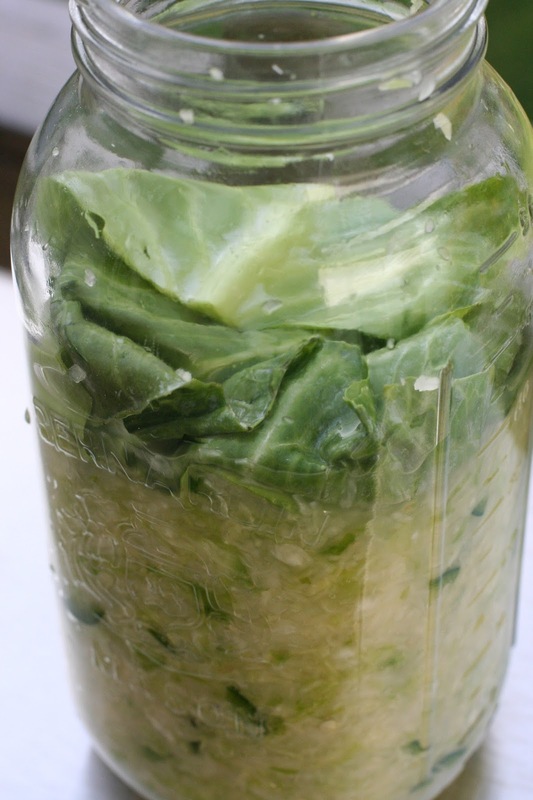 Transfer the cabbage to a large glass jar. I use a big 56 oz jar. Tamp down the cabbage (here is where the sauerkraut pounder really comes in handy) so that the liquid covers the cabbage. 5. Cover the cabbage with the leaves your removed in step 1. Rip the leaves into small pieces if necessary. Fully cover the cabbage right to the edges of the jar. Use a knife to tuck the edges down a bit so that pieces of cabbage don’t float tup during the ferment (see pic above). 6. Tamp the cabbage leaves down so that they are submerged. 7. Place a smaller jar (or something non-reactive) on top of the leaves. It needs to reach the top of the bigger jar. Place the canning lid on upside down (i.e. rubber seal up), and then tighten on the metal ring. 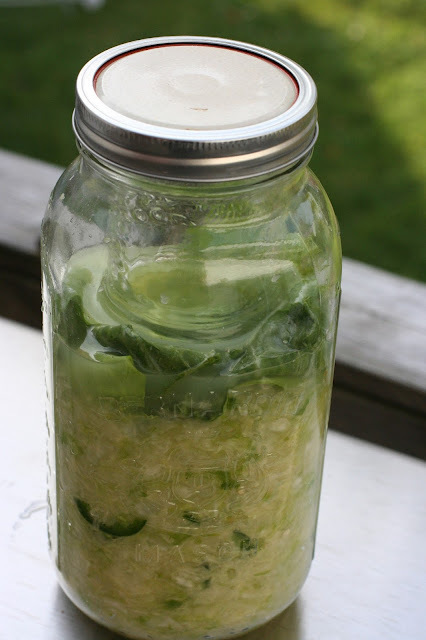 The idea here is to keep the kraut and leaves compressed and submerged throughout the ferment. The upside down lid will allow gas to escape during the ferment. 8. Place somewhere away from sunlight and direct heat (coolish room temp is great). Ferment away! I think 1.5 weeks makes for the perfect kraut. It will bubble and foam–this is what you want to see. Check every few days: remove the lid and take a sniff. It should not smell rotten or unpleasant. To my nose, kraut that has not fermented long enough has a slightly metallic air to it which mellows out after about 10 or 11 days. Remove the cabbage leaves from the top and enjoy! Refrigerate until used up.